ZoeeTree Bluetooth 4.2 Wireless Speaker for 10 hrs Music Streaming & Hands-Free Calling / 5W + 5W 40mm Dual Driver Speakerphone, Built-in Mic, 3.5mm Audio Port, Rechargeable Battery for Indoor & Outdoor Use. √ Dimension : 7 x 2.5 x 2.3 in"
√【CLEAR STEREO SOUND】: ZoeeTree Bluetooth Speaker adopts advanced patent amplifier IC boost maximum volume enhance up to 50%, 5 x 2 watts high-end low-impedance speakers more larger than others. And speaker's stereo realized through dual high-sensitivity drivers and a unique spiral bass port. √【PORTABLE WIRELESS SPEAKER】: You can enjoy music when you're lounging around the house, or partying, camping, biking. The speaker built in bass chip and bass diaphragm, can provide a intense bass sound. The same sound quality, but just half the price with the premium sound quality of JBL/Creative/Sony speakers. 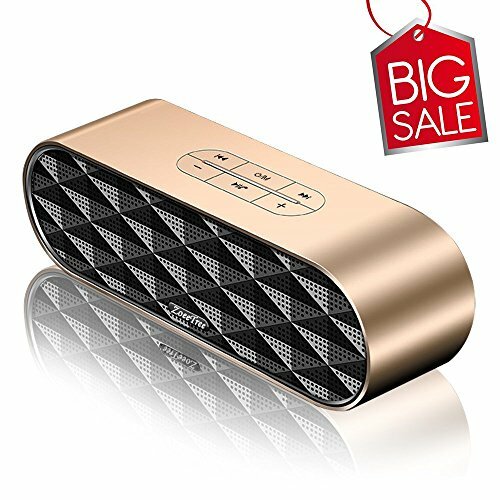 √【BLUETOOTH 4.2&NFC MATCH】: S3 Speaker adopts latest bluetooth 4.2 with A2DP, connect fast and stable, can compatible with ios, android devices, and kindle. And even can play audio by using 3.5mm aux cable. NFC quick match, a cool and useful feature absent from the most wireless bluetooth speakers on Amaozn. √【LONGEST BATTERY LASTING LIFE】: Outdoor wireless speakers built-in rechargeable 2000 mAh lithium-ion polymer battery that can provide up to 10 hours of endless music! Aluminium unibody housing Built-in Micro SD TF card slot. So much better for travel and gym, superlight and easy to fit in your pack, baggage. If you have any questions about this product by ZoeeTree, contact us by completing and submitting the form below. If you are looking for a specif part number, please include it with your message.